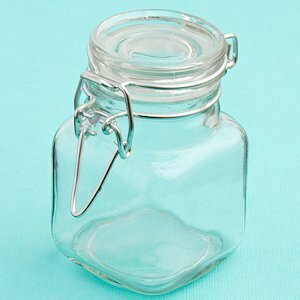 A vintage-inspired design, our Perfectly Plain Collection Apothecary Jar Favors offer a ton of options to be creative and add your own style to each! The clear glass jars feature the classic apothecary shape with a hinged lid that has a silver metal air-tight locking gasket to keep contents fresh. They are perfect to hold decorative sand, candies, small trinkets and more! Each favor measures 1.75" x 3". Are they safe for food/nuts? Yes, it is. It has an air-tight locking gasket to keep your food fresh. How many oz (approximately) can fit in this jar? is it 3 inch high and the lid is 1.75 in diameter? Correct, 1.75" in diameter and 3" high. The capacity is 4.57 oz.